From startups to established businesses, tech companies to agricultural firms, each of these businesses require websites to reach out to the world, bring in new customers, and nurture those clients who have been around for a while. But if you don’t know how to code, how can you get a site up and running quickly? The answer lies with corporate WordPress themes, of course. There’s a small chance you, as a corporate executive, know how to code and design a website. But even if you were the best designer in the world, there is no reason to start a website from scratch. The themes we’ve gathered here provide efficient and affordable ways to make your corporate sites look great. What Makes a Theme “Corporate”? A lot of the time, the word corporate is used interchangeably with “professional” and that definitely applies here as well. The themes included on this list are undeniably professional and sport clean lines and dedicated sections and pages for showcasing relevant information such as team members, services, pricing, and more. 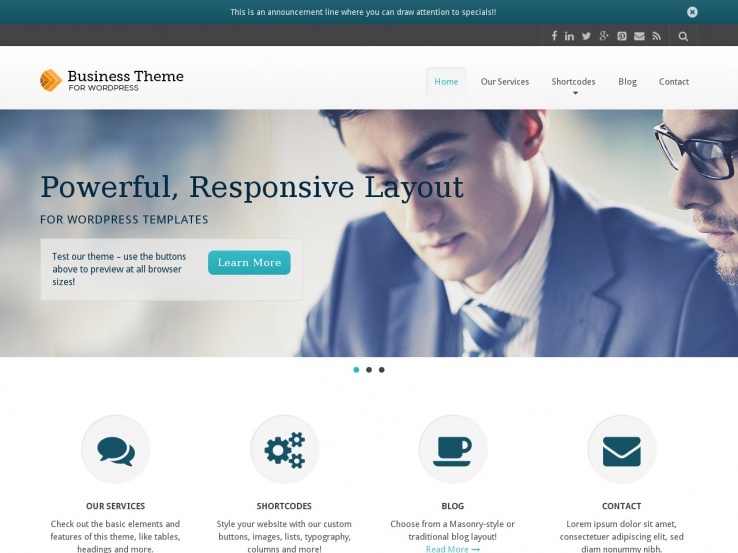 Because these themes work with WordPress, you can rest assured that setup is quite easy and straightforward. Once installed, all you need to do is make a few setup configurations (like choosing your color scheme and uploading your logo) and add your content. That’s all there is to it. Keep reading to learn more about some amazing themes for both small and large businesses. Provide is one of the most comprehensive and Professional looking Business Consulting Multipurpose WordPress Theme for the users. It is designed for keeping in mind the needs and requirements of the corporate world. 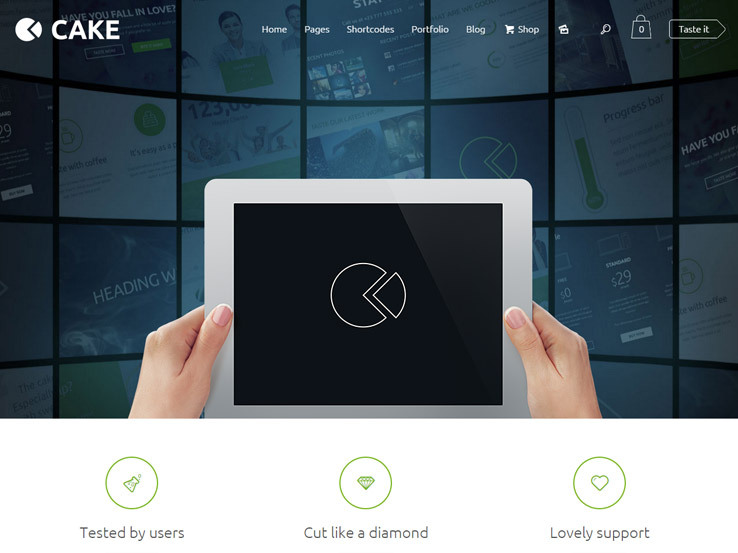 This theme just needs one click of yours, and it can create a website for you in few seconds. You can read online documentation, detailed video tutorials in it. It has 12 pre-built demos, and all of them are easily importable. These demos are fully and entirely customizable and are pre-built demos comes with modern in style home pages as well. 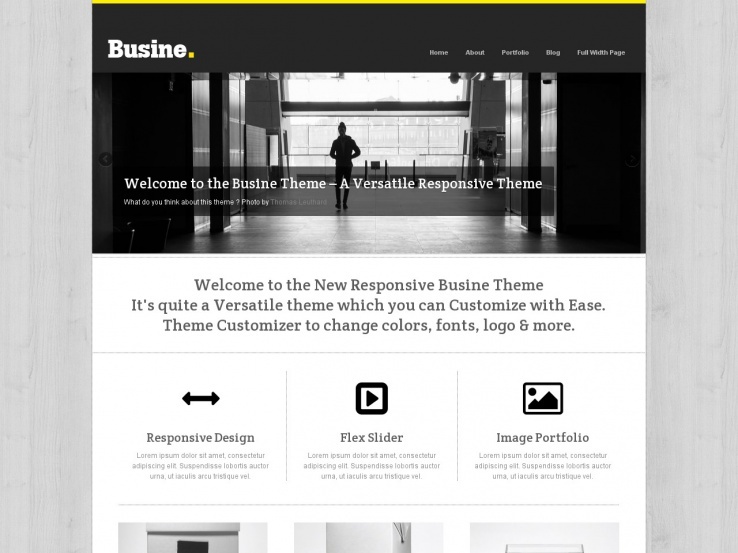 It is retina ready and responsive ready theme, and one of the recommended mobile friendly themes. It needs a single click and imports its demos easily on your system. It has revolution slider and layer slider plugins in it. Through the use of its visual composer, you can customize its pages and layouts, colors in any way you want to. This theme has the simplest controlled features. No science is involved in it to use it. It is RTL supported and carries many blog page layout, header style options in it too. 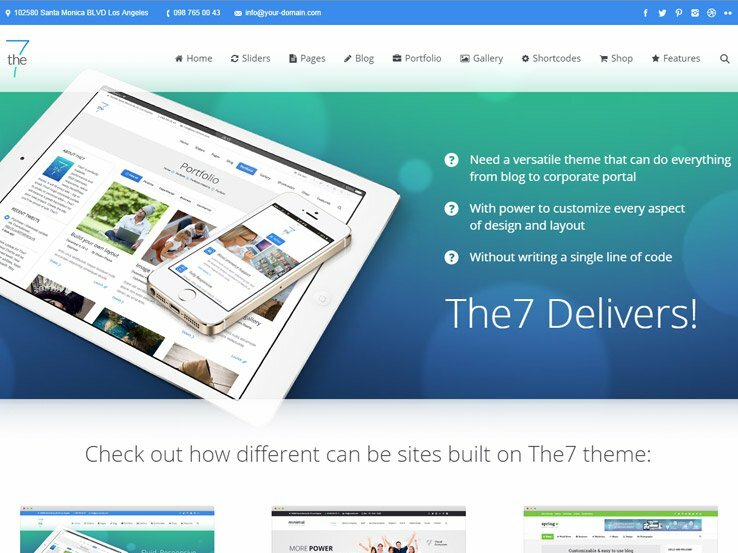 TheGem is a new jewel in the world of multi‐purpose corporate WordPress Themes. 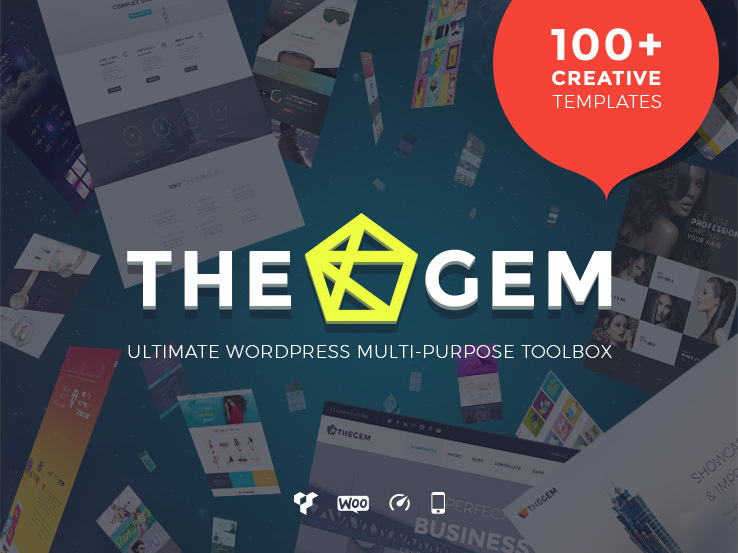 Designed and developed as an ultimate web building toolbox of design elements, styles, and features, TheGem will help you build impressive, high­-performance, fast loading corporate websites in minutes without touching a line of code. The Gem has been carefully crafted for a variety of business industries and creative uses with such flexibility it really could be called the Swiss Army Knife of corporate WordPress themes! Perfect for corporations of any sizes, creative agencies with specific demo pages to get started, or an online business of any nature, with fully featured WooCommerce store pages ready to go, your website will spring to life within minutes. 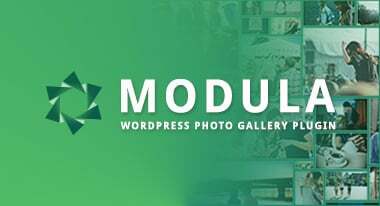 This theme also covers the needs of freelancers, photographers, architects, and digital artists, offering amazing portfolio features with dedicated designs to suit individual needs. TheGem has become one of the best-sellers right after its release and it’s definitely worth checking out! Visit live preview and go over all 40+ pre-designed layouts and sub-pages and enjoy proper user experience. It’s truly one creative masterpiece with everything you need to build a professional website. 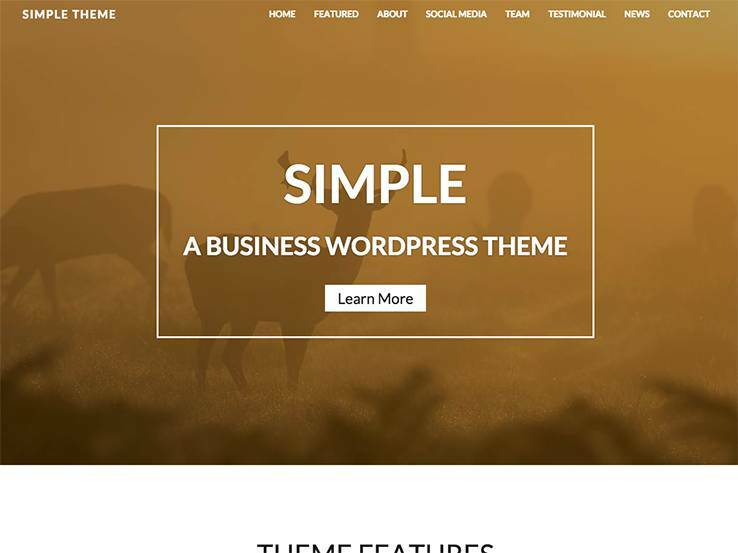 The Simple theme starts off with a bang because it has a stunning header area, which is perfect for capturing the attention of your visitors. The parallax elements are quite helpful in that aspect, especially when you add buttons to serve as the call to actions that direct people to your most important pages. The Simple theme has a one-page layout, so the navigation menu is used to jump to different sections of the homepage. For example, if someone clicks on the Testimonials tab, they will immediately be sent to the area on the homepage that shows testimonials. This is a huge advantage for corporations worried about website speed. Not everyone inside a corporation has the needed knowledge to design a beautiful website, so the backend customizer is your friend when it comes to changing colors, modifying text, and uploading images that look professional. The theme looks great on mobile devices and the social media buttons are perfect for connecting with your audience on social media. The team members section is the perfect spot to add a human touch to your brand and feature your employees or partners along with their profile image and social media profiles. Consider the Venture business theme if your corporation is looking for more of a creative and edgy look. The header features a large stunning image with parallax effects that is sure to capture the attention of anyone who lands on your website. It’s a good choice for agencies and creative firms that use high-resolutions images to make an impression on their website visitors. You’ll also notice quite a few call to action buttons, which are handy for large and small corporations that have a distinct goal when people land on their site. Brand identity is the major goal with the Venture theme and you an easily build brand recognition thanks to the logo uploader and unlimited color choices. You can extend this further by customizing your typography with Google Fonts. Additionally, the team module adds a human touch to your brand, allowing you to feature your co-workers with their photos and short bios. The social media buttons are a must-have for thriving companies and your latest articles are highlighted with large featured images and article previews, all of which are organized nicely on the homepage. 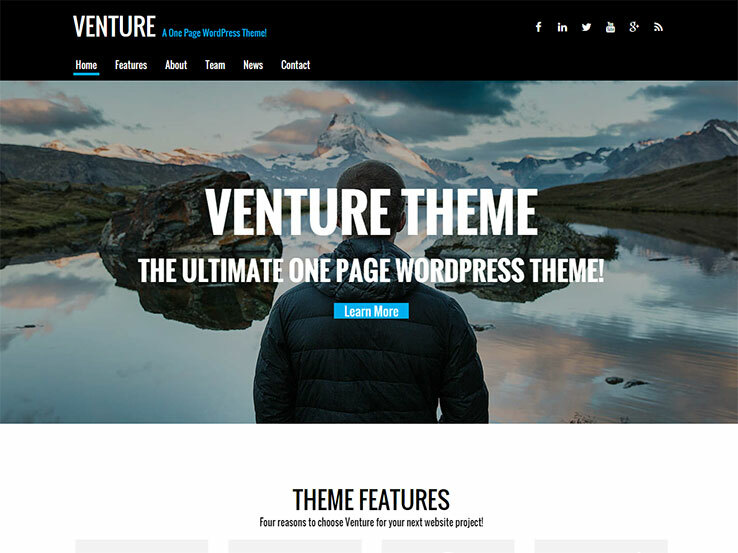 Along with responsiveness and a contact form, the Venture theme provides the tools necessary to connect with customers and create a successful online presence. 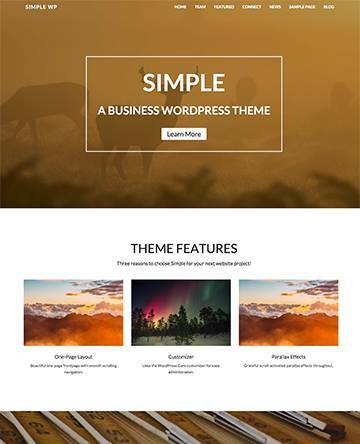 The Simple Business WordPress theme is a favorite from Nimbus Themes, with a minimalist background and playful, colorful icons and designs for a fun, yet professional, layout. The responsive theme works on all devices and you can integrate all of your social media profiles to grow your social media presence and connect with your audience. 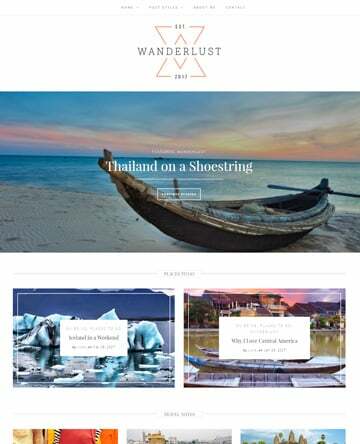 The multiple page layouts work nicely to allow for some variety and unique design on all your pages and the slider options offer different ways to display videos and images without touching code. The unlimited color variations and hundreds of font choices allow you to add your own visual style. It’s a wonderful theme for those who don’t want to distract customers with a bunch of unnecessary bells and whistles. Despite the dull name, Business serves as a wonderful corporate WordPress theme, with a one-page layout and parallax shortcodes that are a great way to make a lasting impression on anyone who lands on your website. The one-page style is great to maintain a beautiful layout on just about any interface, and it minimizes the amount of clicking needed to get to the content that matters most. The layout and slider have plenty of options to make your website stand out from the competition. The special announcements section is another notable feature since it shows the most important events and news about your company without clutter. Use different sections to showcase previous clients, testimonials or services. On top of that, the blog is available in a grid-based view to save on space and present the content in an organized fashion. 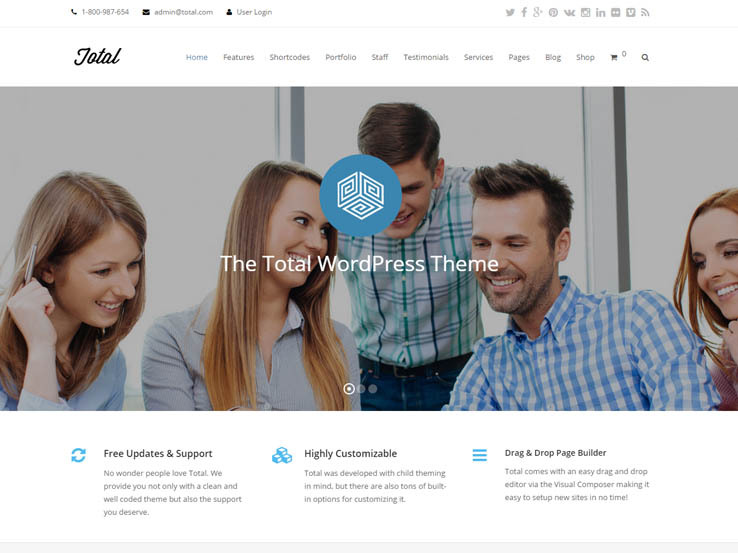 If you’re in the market for a new corporate/business WordPress theme, then you need to check out the Total theme from WPExplorer. WPExplorer is the theme company behind hit themes like PhotoPro, Earth, and Office and they are known for providing superior support and top quality themes. 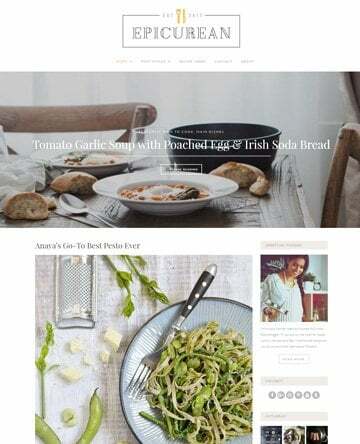 The Total theme is a great example of a multi-purpose theme because it offers such powerful flexibility that you can use for pretty much any kind of website. Click the Demo button above to get a feel for this. You’ll see industry specific demos that range from classic businesses like healthcare to personal blog websites, as well as demos suitable for high-tech startups like apps and software, and traditional companies like construction. 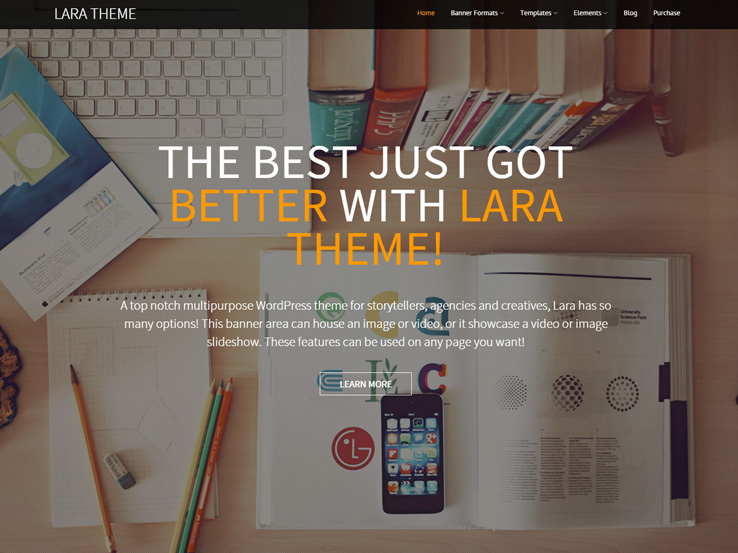 The Lara WordPress theme provides endless possibilities for corporations of all sizes, and it all begins with the one-page layout. This design makes it possible to quickly show everything you have to offer as a company while also displaying items like testimonials and team member profiles. The responsive nature of the theme will ensure your website looks great on mobile devices while the six different blog layouts add variety to your articles and improve your search engine rankings. You can implement a video or image banner on any page you want and it only takes a few minutes to activate this feature. The one-page layout has nine different sections to choose from so you can include areas for testimonials, team photos, a blog feed, and more. We understand that not everyone in a corporation is skilled in terms of web development so the Lara theme comes packaged with several shortcodes, which are handy snippets of code that you can add anywhere on your website to make items like buttons. The social media buttons blend well with the Lara theme, and they are designed to improve conversions and grow your social media following. Finally, the custom CSS section has a field for you to add your own code, making this the ideal theme for web designers who are making websites for corporate clients. 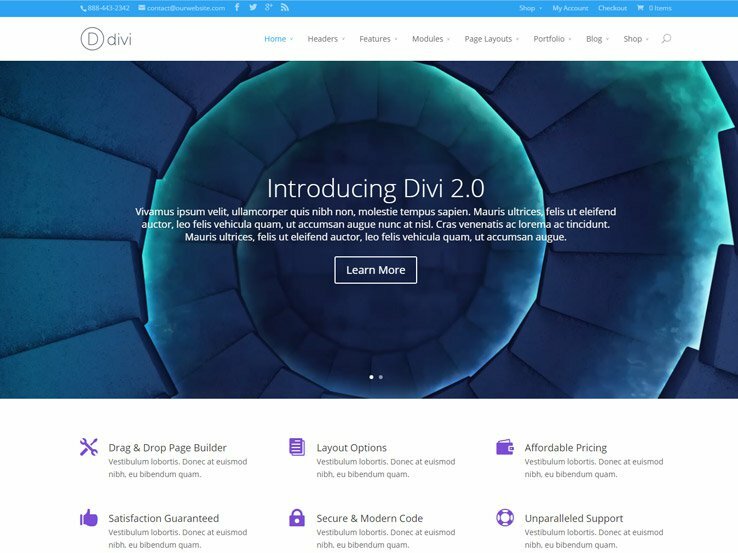 The Divi theme is truly one of the best WordPress themes of all time and it keeps popping up on these lists for good reasons. 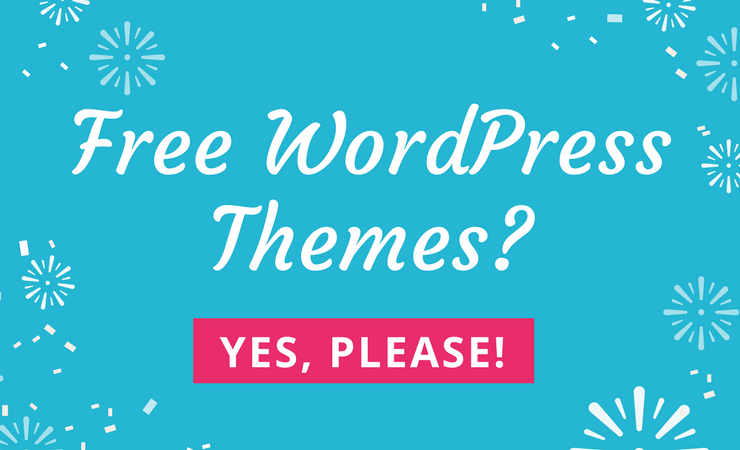 Although Elegant Themes requires you to pay for an annual membership, the pricing is rather low and allows you to access all of the themes and plugins they have to offer. 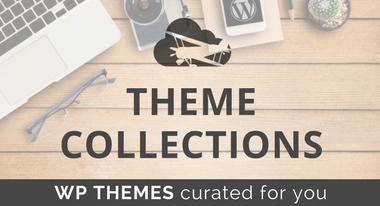 One of those themes is Divi, which is extremely versatile and an easy-to-use theme. Divi includes a drag-and-drop builder that allows you to create unique layouts without the need to touch a single line of code. The theme provides 18 pre-made layouts ensuring that you can quickly jump start your development and standout from the competition. The Divi theme is responsive and looks good not only on large screens but also on phones and tablets. The header options are virtually endless. The theme options panel will allow you to adjust your colors and fonts, add your logo, and much more. 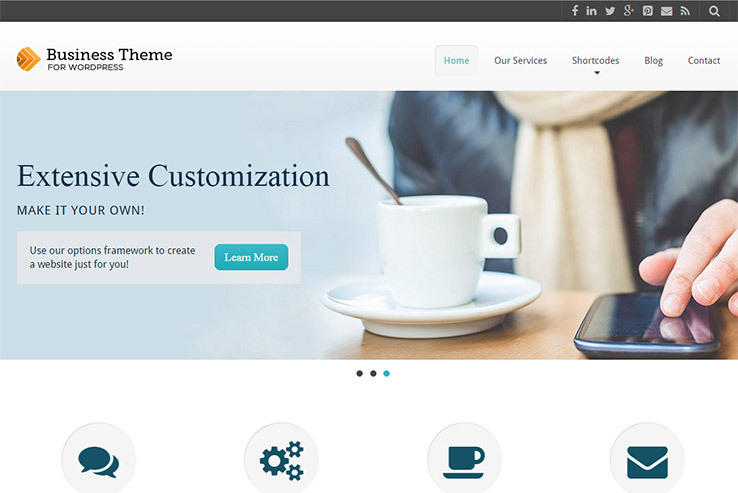 The Cake WordPress theme is one of the most versatile corporate themes on the list, with features such as responsive design and unique design options. The intuitive Muffin builder is a drag-and-drop builder that makes it easy to drag and drop content blocks like video, column layouts, social media icons without the need to touch a single line of code. The theme shortcodes help in keeping your hands free of sloppy code, meaning that all you have to do is add a quick line on a page or post to see modules like buttons or sliders. Cake integrates well with the WooCommerce plugin, which means setting up your eCommerce store is easy. Finally, the theme is SEO ready and translation-ready so you can easily translate your entire website. 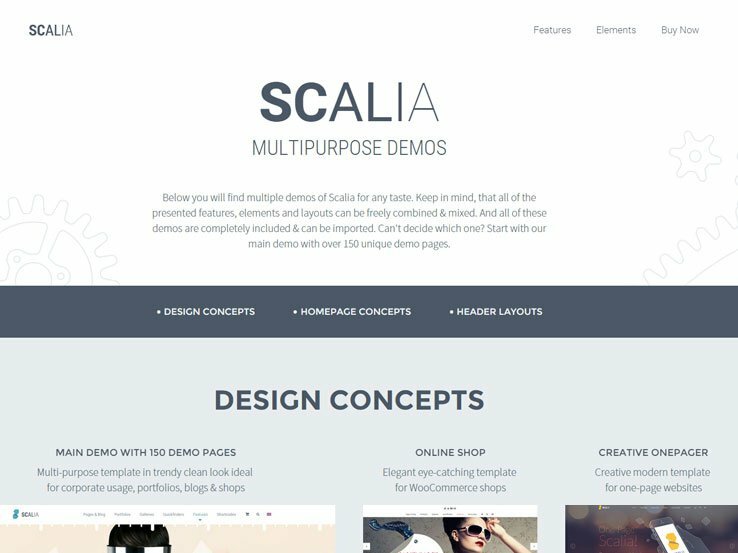 The Scalia WordPress theme provides five unique designs and 150 different page templates meaning that you can create a unique design for each page on your website. This one-page corporate WordPress theme has a sleek and modern design that looks beautiful on all tablets, smartphones, and computers. 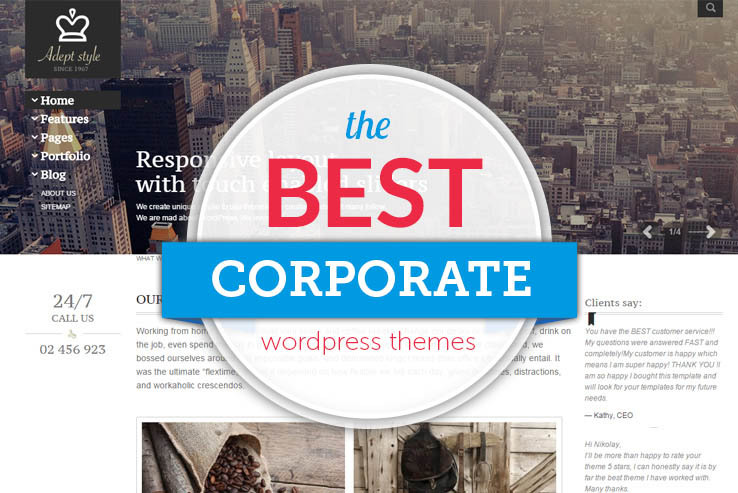 Blogging is a huge part of running a corporation, so this theme offers eight blog styles. Choose from many portfolio layouts, depending on whether you want to share your actual portfolio or a list of past clients. Don’t forget to include video or picture testimonials to build trust in potential clients. The attractive shop pages are great for boosting your sales and the multiple gallery options put your images at the forefront of your marketing strategy. Busine, from Theme Furnace, has a portfolio and corporate brochure layout that is perfect for sales and marketing websites. 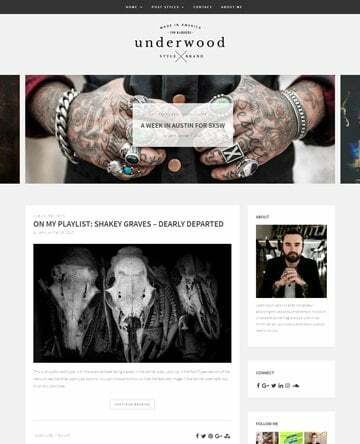 It has a simple, black and white color scheme with a stunning slider and responsive design. Upload a logo within seconds and change the colors to add your own style. Hundreds of Google Fonts are at your fingertips, so add your own brand to your site with all the colors, texts, and backgrounds you need. Custom widgets allow you to add different elements to your website so consider adding social media icons or feeds, Dribbble, advertising, and Flickr. The theme includes an extensive documentation should you need any help in setting up the theme. Keep in mind that the theme is completely localized, so you can easily translate your website into another language. 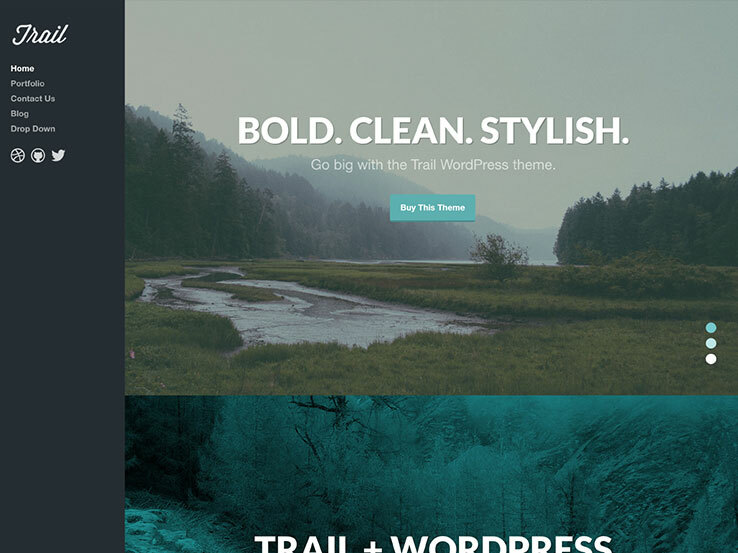 The Trail theme is a beautiful theme for corporations that want to add a little edge to their website. The theme’s navigational menu sits to the left-hand side of the homepage which brings your content into the main focus. The full-screen header image allows you to easily add an image of your product or your team, and the responsive nature of the theme allows visitors to view your site on mobile devices. Shortcodes are a great asset included with the Trail theme since you can generate anything from buttons to toggles without having to code the elements yourself. Use custom widgets and upload your own logo within seconds. The theme customizer allows you to customize your website with ease and the video support is great for embedding Vimeo and YouTube videos on your company website. On top of that, Trail is completely localized, allowing you to translate your website and reach a global audience. The filterable portfolio is essential for bringing in new clients and the page templates make it easy to create contact pages, homepages, and portfolios. Along with a parallax homepage, fast and friendly support, and a beautiful design, the Trail theme is one to check out. Check out the Yopta WordPress theme if you’d like a corporate theme that puts emphasis on contact information and social media buttons, placing them at the top of your homepage. The theme features a beautiful slider, which is great for displaying information about your firm or adding photos to announce promotions and events. The search bar makes it easy to find relevant information. It’s completely responsive and the blog is a great way to boost your search engine rankings. Give an outline of what services you offer on the homepage and include custom icons for a creative touch. The clean, multipurpose theme provides a contact area with maps and interactive contact buttons. Add a custom background and upload your logo to build brand recognition. The custom widgets are wonderful for adding extra content to your pages, and various social sharing buttons prompt users to share your content with people all over the world. 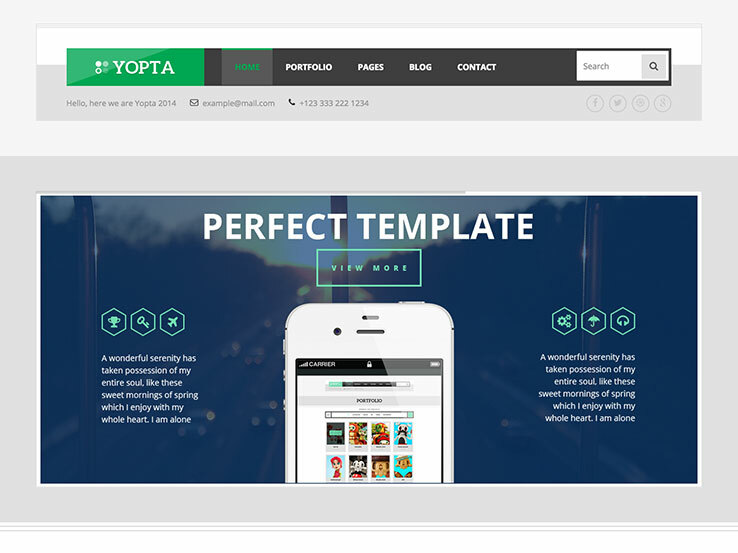 The Yopta theme comes with a full portfolio, which is an excellent way to show off your past work to potential clients. Finally, the drag-and-drop form builder is one of the easiest ways to design forms that allow you to keep in touch with your customers. Simply drag and drop the fields you’d like to see on the form and publish them on your website. 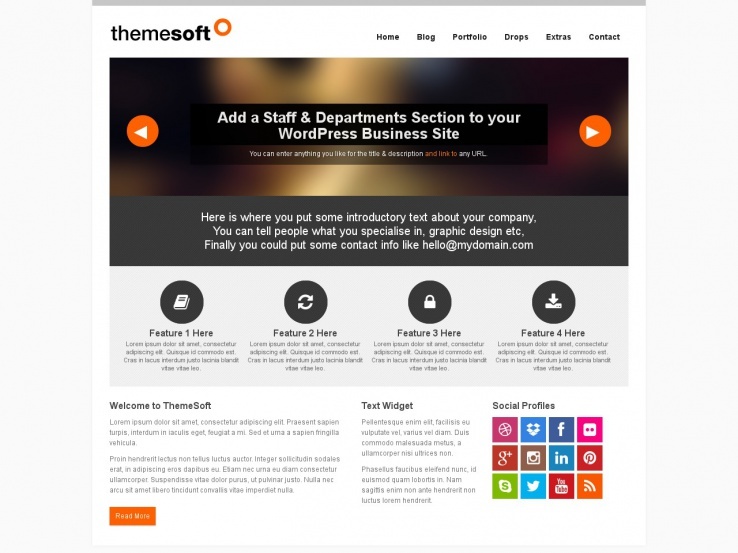 The Themesoft theme provides a sleek way to connect with your corporate clients with a clean and beautiful layout. It’s fully responsive and the portfolio supports nice thumbnail images and a wide variety of links for you to provide more information about past projects. The theme customizer has a lot of settings for you to play around with. You can upload your logo and change colors to match your brand. The responsive slider looks great on mobile devices and it helps you show off beautiful images that serve as banners for announcements. You can also change the typography. Custom widgets are available to display certain social and interactive modules. Connect with people through Facebook and Dribble widgets and even post advertisements to monetize your website. You’ll notice that a full blog is offered so you can share tips and tricks with your audience and the social buttons are perfect for connecting with your visitors and clients on social media. You can even add additional widgets such as your address, tags, recent posts, and more to your footer. 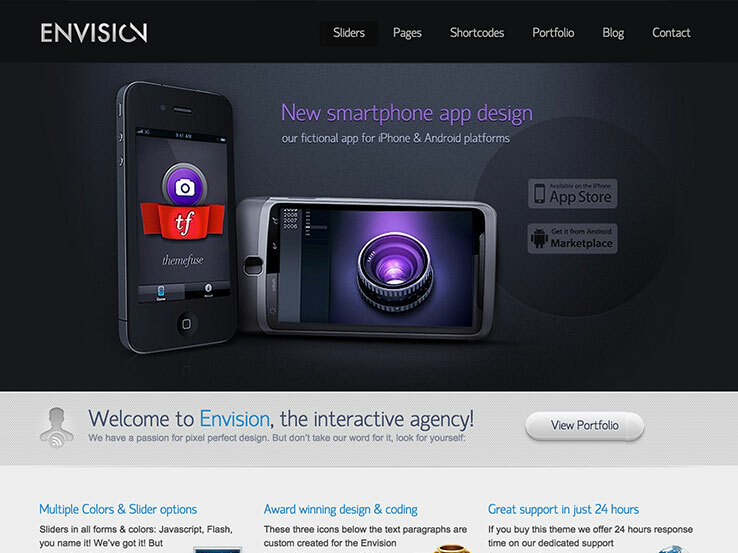 Check out the Envision WordPress theme if you’re looking for a modern theme with plenty of easy customization options. One of the main problems many companies have with building websites is that they don’t want to spend too much time creating the site or they simply lack the knowledge required to customize. Therefore, a WordPress theme with lots of shortcuts, quick codes, and visual settings are best. This theme provides a wide set of shortcodes, allowing you to build things like buttons and columns without the need touch a single line of code. Five different sliders are also included with the theme so you can feature your best content at the top of your site. Use the sliders for promotional banners or show images of their products in use. No matter which option you choose, a slider is one of the first items people are going to see when visiting your site so it’s a great area to include a call to action. As with most modern templates, the Envision theme provides a responsive layout, making it easy for your followers to view content on mobile devices. The admin interface is specifically designed to look simple and intuitive, and it includes areas and tools that are great for managing color combinations and logo placements. A contact form is included with the theme so you can allow your clients to get in touch with you easily, and several sidebars allow you to present your content in an organized fashion. The theme provides multilingual options, making it easy to translate your website, and the SEO options are perfect for boosting your search engine rankings. Along with a one-click demo import and a one-click install button, the Envision WordPress theme is a wise choice for companies big or small. 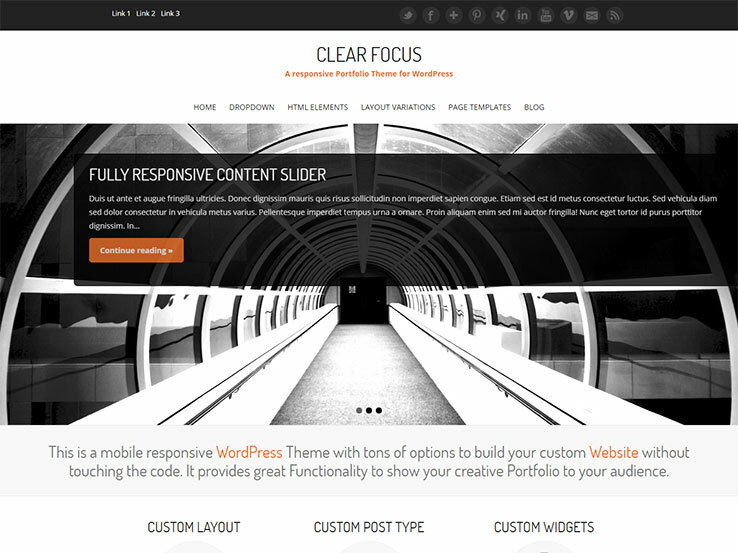 Clear Focus is a versatile, corporate WordPress theme suitable for companies, agencies, and freelancers. With a responsive design and plenty of customization options, you can create a unique website for your business. The homepage features a gorgeous slider at the top which is a great way to display your content. The slider can be configured to show posts or pages. You can use the large message area right below the slider to greet your visitors or to show a small blurb about yourself or your company. The three feature boxes below the slider allow you to bring focus to your services. Further down the page, you can showcase your portfolio with another smaller slider and then you can invite your readers to dive deeper into your website and read your blog posts. Clear Focus offers nine additional page templates for a portfolio page, landing page, and blog pages. You can customize the colors easily and you can create unique layouts with the help of widgets and theme options panel. Clear Focus is a great choice if you’re looking for a theme with an attractive design and plenty of customization options. If you want complete control over your website’s look, consider The7. The7 features more than 630 customization options, which means you can build a truly unique and amazing website. Additionally, The7 features responsive, retina-ready design and SEO optimized code. This theme can adapt to any niche thanks to its numerous homepage layouts that range from restaurant and construction to digital agencies and law firm. You can also integrate WooCommerce easily with your theme that turns your website into an online store and allows you to sell both physical and digital products with ease. Custom layouts can be built with the help of Visual Composer Builder and their Design Wizard allows you to tweak everything from logo and colors to typography. Use sliders to show off your company’s best features, and add any element to any page thanks to more than 40 shortcodes. 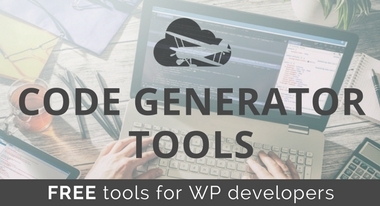 And if you want to extend your website’s functionality even further, you’ll be glad to know that The7 includes plugins such as pricing tables and integrates with all major popular WordPress plugins. Thank you admin. Theese are providing supply for any demand. liked the themes you shared. Thank you for helping us. I have found one more that is Biznetic. It has very amazing features like Front-end property submission and edit, Advanced search, Google Maps integration, Advanced Properties filter etc.